Another blank entry. 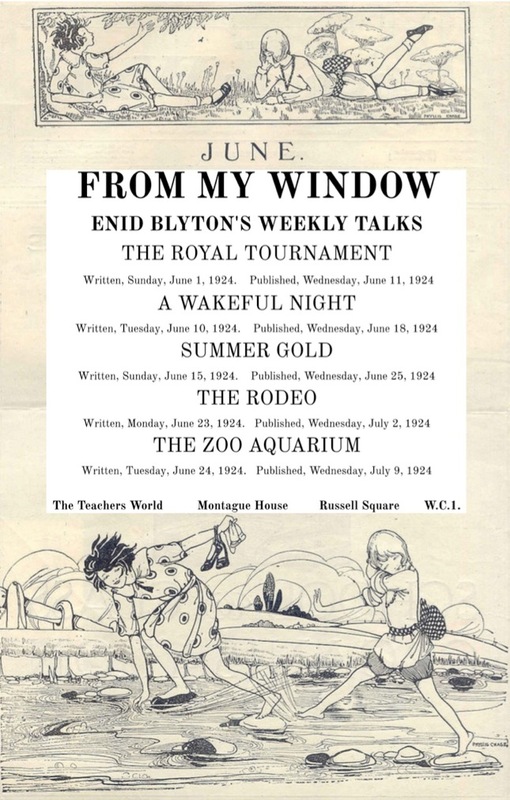 But that one-and-only diary entry towards the end of May tells us that on the 31st, Enid went to Olympia to see the Tournament there. 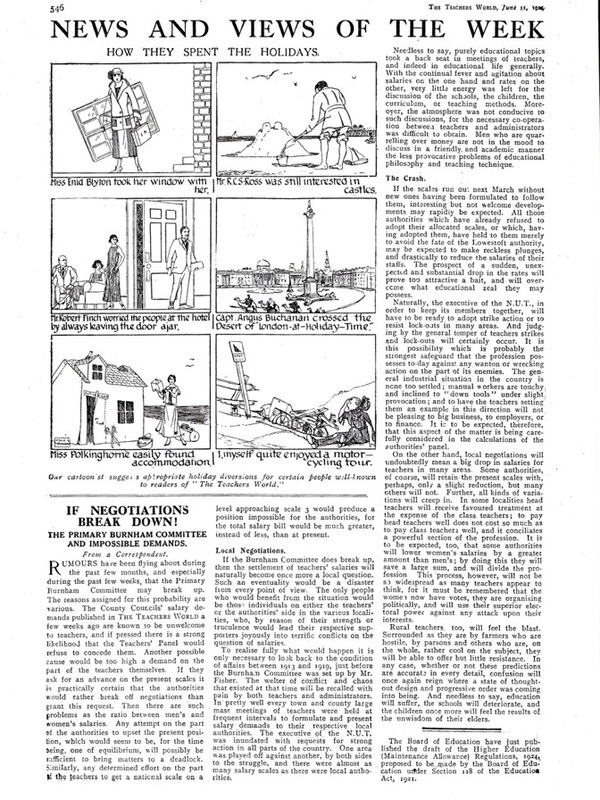 The next day she wrote about it and it’s reproduced below. The work log tells us that Enid went on to write four 'modernised fairytales' this day. That is, four of Aesop's fables were rewritten for the 'modern' day. The 'Monkey and the Cats' was rewritten as 'The Tramp and the Boys'. Instead of a monkey settling which piece of cheese was the bigger half by nibbling on first one piece then another, a tramp does the same for two boys in respect of a jam tart. Crikey! - I can't see the piece of writing working for a child of 1924, never mind the puritanical sensibilities of the 21st Century. 'The Milkmaid and her Pail' becomes 'Betty and her Eggs'. In each case, the protagonist gets ahead of herself as to what she's going to do with the money she will get on the sale of her produce, and, in so doing, carelessly destroys the product. 'The Fox who lost his Tail' becomes 'The Boy without shoes'. In each case, an unfortunate creature tries to convince his peers that what he has lost the rest would be better without. And, unsurprisingly, fails to convince them, and in the process becoming a laughing stock. The fourth modernised fable is 'A Stupid Quarrel'. I don't think that updates any of the 22 Aesop's fables in Enid's book. Though I could be wrong. A fairly straightforward description. With only a little insight as to what is is to be a soldier, or a horse for that matter. Diary blank. In her work log, Enid noted that she wrote a 2300-word chapter for The Zoo Book called 'Animals of Long Ago'. This didn't make it into the book itself. I really don't think that at the beginning of June, Enid was working at her normal high standard. My Fairy Book is passed! 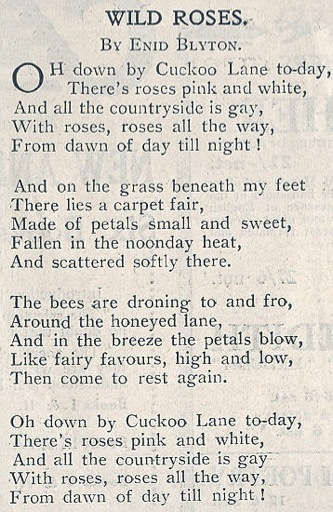 In October 1924, both The Zoo Book and The Enid Blyton Book of Fairies were published by Newnes. I'm guessing Hugh commissioned the fairy book as well as the zoo, especially since they came out in the same format, though they were markedly different types of book. Diary blank. Work log blank. Maybe Enid was recharging her batteries. I worked all day. Hugh phoned me at 6.15 to say he was coming down to see me & bringing 2 rings for me to choose from. He came & we looked at them in the summer house. They were lovely but the one I’ve chosen is adorable. Hugh was such a dear & I did love him so. It will be lovely to be really engaged. OK, so the signet rings weren't engagement rings. But these were. Unusually, there is a disparity between the diary and the log. Enid states she worked all day but there is nothing recorded as having been written. Perhaps a chapter of the Zoo Book was written and discarded! I was very excited all day because I was going to meet Hugh & go to a dance with him & have the ring. He fetched me at 7 at Charing X & we taxied about in the Park & he gave me my ring. It’s a LOVELY one. Then we went to Prince’s to dinner & a dance. There was a cabaret show again and we got 4 balloons. I loved dancing with Hugh – we caught the last train & I got home at 1.15 & Mums was waiting up for us. It was so lovely to have Hugh come right home with me. He was such a darling all evening & he looked so nice. It’s been a heavenly evening & it is simply lovely to be engaged to my darling darling Hugh & to have his ring on my finger. Mums waited up for them. Because she was worried Hugh might not take care of her precious friend? Because she didn’t entirely trust him? Hugh felt rotten all day because he’d eaten something bad at Princes. But he played tennis after tea with me & A. Maud & U. Ken. Peggy came too. Mums & I marked out court etc in a.m. & I sent Hugh to sleep in the afternoon & he did. He looked much better this evening, darling old son & he certainly was brave over it all! Could it be possible that Hugh was heavily hungover? After all, it had been the night he put the ring on Enid's finger and he may have needed Dutch courage. Hugh had had problems with drinking in the past and would do again in the future. Clearly, Enid didn't drink regularly herself and could have been oblivious to Hugh knocking back a few stiff ones. We went to church in a.m. & Hugh & I sat together at the back. In the afternoon we were alone in the drawing room. And after tea we looked through the zoo photos Hugh brought down. After dinner we were alone again. It is so lovely having Hugh here. Enid seemed to have few doubts about the marriage. That's the main thing. Though a part of me fears that she was being manipulated by offerings of flowers, chocolates, medals and rings. Not to mention book commissions. Hugh & I played tennis all a.m. & I beat Hugh once out of 6 times. He plays very well & he was quite pleased with my play & I was awfully glad. Aunt Maud & U. Ken & Peggy came again & we all played tennis till 7. Hugh played 17 sets & I played 15. Hugh & I were alone after dinner till bed. I went in to see him in bed. Hugh would have been staying over in the spare room. Physically they would have been close by now, with the marriage just a few weeks away. Saw Hugh off at 9.33 & it was horrid. I worked all day at my writing. Hugh phoned at 6.30 & sounded very jolly. He is a perfect darling & I love him. Although Enid's work log states she wrote her latest Talk on Monday, I suspect it was written on this Tuesday. Again, this story is effectively about Hugh. At this stage he is still living in digs elsewhere in London, but within a week or so of this piece being written, Hugh will be staying in a guest house on Oakwood Avenue, so that he and Enid could spend every evening together without having to worry about him getting home. In the meantime, some nights, Hugh stays in the 'little' room which may be the guest room that Enid was staying in before she got her own room on giving up her weekly commute to Southernhay. But not this night in question, one surmises. Enid has to look out the window when she hears steps coming along the road late at night. It's a policeman, or it's the lamplighter, not her husband-to-be. Sorry, Enid, you'll have to wait a few days yet for Hugh to move to Oakwood Avenue. 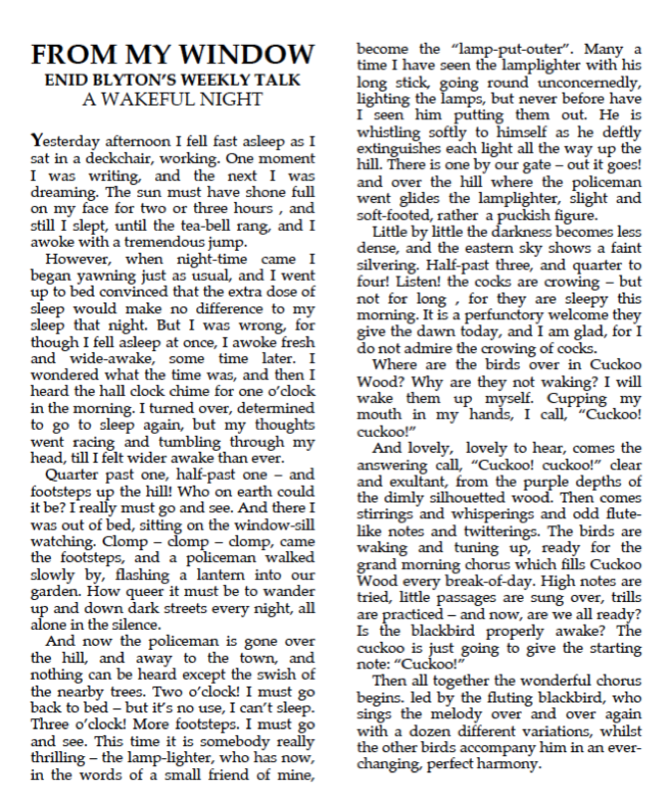 Like the May Talk when Enid was awake all night, and wrote about the close fly- past of the owl, this most personal June Talk locates Enid right at the centre of her life. Frustratingly, I can’t quite position her on the 1930 map. 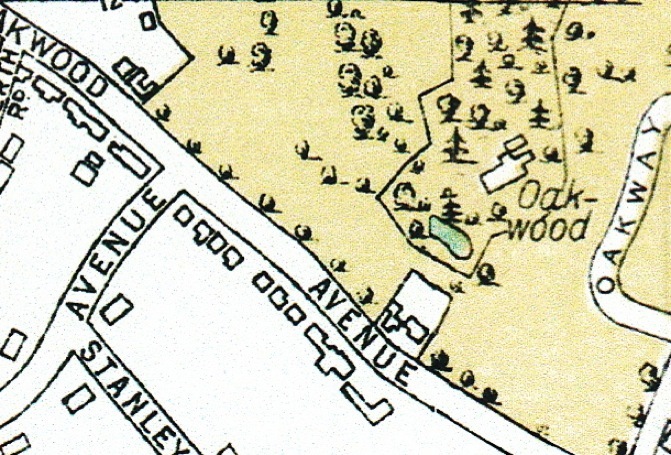 The house is one of those on the south side of Oakwood Avenue, near the middle of this map. As we know what the house looks like, with white walls and a red roof over the first floor, it should be possible to locate it precisely in 2018. 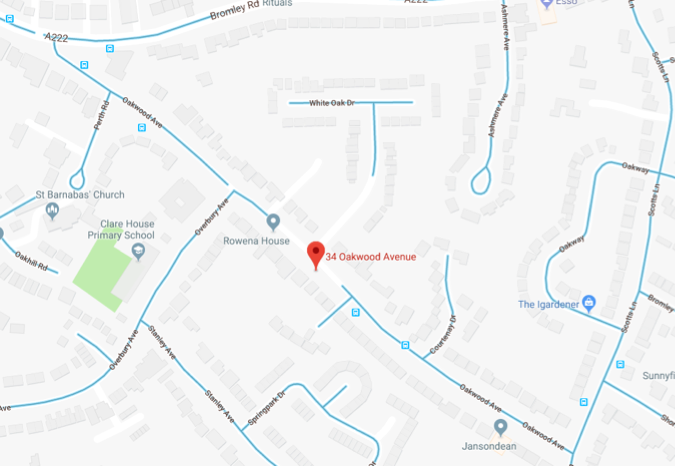 But as you can see from the Google Map image below, 34 Oakwood Avenue is in a blind spot as far as Streetview (the blue network, following the roads) is concerned. True, 34 Oakwood Avenue has been marked in red by Google, but that is an approximation and in my experience, may be a house or so out. Let’s face it, that’s good enough. Nobody wants to pin this butterfly to the board. And anyway, what would be the point? The wood is all gone, and with it the owl, the cuckoo and the remarkable young woman at the window. Odd that about the blind spot though. Makes one think that the present owners of 34 Oakwood Avenue may have got in touch with Google and asked for the house to be taken off the radar, as it were. They couldn’t shake the feeling that the rest of the world was looking in through the window. Couldn’t shake the feeling that there was a ghost upstairs, sitting on the window ledge, dreaming of her lover, as he shape-shifted between owl, cuckoo, policeman and lamplighter. T.W. announced engagement today. They had a killing cartoon of me in, carrying my window! I worked all day till bed. Hugh phoned at 6.15. I had a heavenly love-letter from him this morning. He is a darling. Below is the 'killing' cartoon. Enid is shown top left. Underneath the cartoon as a whole, the caption says: 'Our cartoonist suggests appropriate holiday diversions for certain people well-known to readers of "The Teachers World". 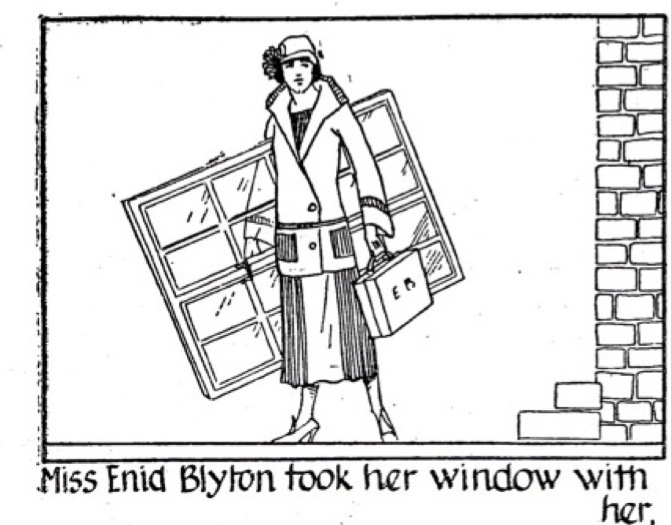 Under Enid's panel, it says: 'Miss Enid Blyton took her window with her'. Thinking about the previous day's Talk, one would think that Enid would be unwilling to move her Window anywhere else! Indeed, since the start of the year several of the most vivid Talks have focussed on 34 Oakwood Avenue: 'Hoar-Frost', 'The Wild Garden', 'May Nights', 'In the Garden', 'Blue Magic' and 'A Wakeful Night'. On the other hand, the Window has been following Hugh around since the beginning of March. Many of the Talks refer to experiences they have shared, even though Enid sometimes hides Hugh's presence: 'An All-Day Walk', 'The Ideal Homes Exhibition', 'The Ten Commandments', 'April in London', 'Thrills at Wembley', 'May Nights', again, and 'The Royal Tournament'. Enid was going to spend the rest of her life with Hugh. That was the intention, anyway. When they found a home together, the 'From My Window' perspective should settle down. Not that the results could be any more compelling than they were in spring-summer of 1924, when Enid had seemingly found both a room of her own and a partner for life. Finished Fairy Map & met Hugh at one for lunch. Then met Phil & shopped & had tea. Then dinner at the Corner House with Hugh. He was very tired & so was I, so we went off a bit earlier. 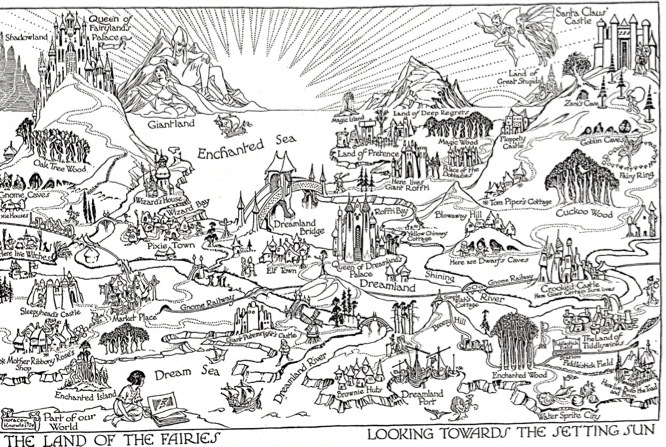 Enid noted in her work log that it took her three-and-a-half hours to draw the Fairyland Map. Her morning's work, I guess. She may have shown the map to Phil when they met, but she might not have. Presumably, the map was for The Book of Fairies that Newnes were going to publish, and they may not have wanted to involve Phyllis Chase. Enid had already drawn a map called 'Titania's Mount in Fairyland' for a July 1923 issue of Teachers World. But that was a view from a hilltop towards the rising sun. Along the bottom of it was written, ‘designed and drawn by Enid Blyton’. In the Teachers World article, Enid expresses her enthusiasm for such maps. She explains that her own map was based on an 'old and expensive map of Fairyland published some years ago, and now unhappily out of print.' Enid urged teachers to tear out the map from Teachers World, pin it onto the wall of the classroom, and leave the children to make remarks. Anyway, the map for the The Enid Blyton Book of Fairies is different, in two respects. First, it mentions the fairies, wizards, brownies, goblins and witches that feature in the book. Second, it is looking over Fairyland and towards the setting sun. Below is a reproduction of Enid's map by the time it was printed in the Newnes book. In other words, Hugh must have commissioned an artist, Horace Knowles, to redraw Enid's second map. Also noted for June 12 in the work log is a 3200-word story called 'The Land of Great Stupids' (see top right of the above map). But I think this must have been written on the 13th of June. In any case, it's interesting because it was included as the penultimate story of The Enid Blyton Book of Fairies. So although the book had been 'passed', as Enid noted on the 3rd of June, either she or Hugh (the editor) had obviously decided that a bit more could bs stuffed in. 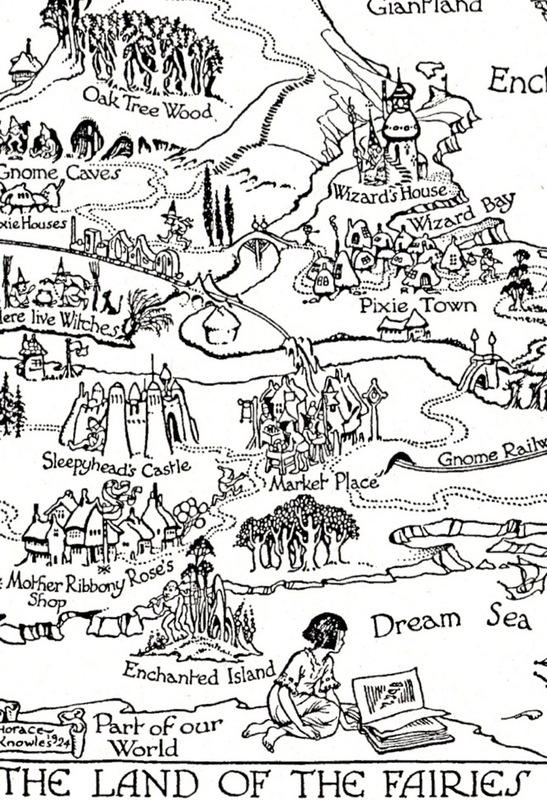 Enid herself is included in the bottom left corner of the map accompanying The Enid Blyton Book of Fairies. That's how I read it, anyway. Worked all morning & slept all afternoon. Hugh phoned at 6.15 & was a dear. I've now read The Land of Great Stupids. It involves two children who are squabbling while playing cricket. (As Enid and Hugh may have been squabbling on the tennis court!) He wishes her gone 'to the Land of Great Stupids'. And, when she disappears, a chuckling gnome tells the boy that that's exactly where his playmate has gone. The boy is instructed to go to the top of Bracken Hill, to make his way via a trap door to the Underground Lake, take a boat to the Gnome Railway, then to Yellow Chimney Cottage where Witch Wimple may give him permission to visit the Land of Great Stupids. In a way, that can be followed in the above map. If you imagine that Enid is sitting on Bracken Hill (part of our world! ), she has to go down, get a boat in the Underground Lake (which links to the Dream Sea? ), then sail to Gnome Railway. Once she's on the Gnome Railway, she travels to Yellow Chimney Cottage (marked on map), which is on the way to Land of Great Stupids (top right hand corner of main map). 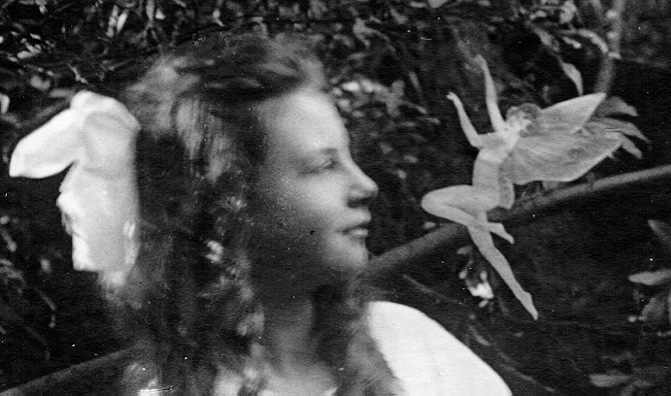 As one reads the story, and The Enid Blyton Book of Fairies as a whole, one begins to see how Enid's fairy world parallels her real world. Bracken Hill was where she went to see the bluebells in flower, after all. I ended up thinking that Enid earns her fantasy world by very close consideration of the natural world. In 'Hoar-Frost' she stands in a frosty garden, for a long time, until the white of the frost gives way, fleetingly, to a rainbow-coloured thaw. She gets the same reward in 'April in London' when the greys streets of the city suddenly spring to rainbow-coloured life thanks to the sunshine. And what about those caterpillars of hers, carefully looked after all autumn and winter, that one day in spring emerge as the most delicate flying creatures? It seems that those who commit sufficiently to the world around them can transcend that ostensibly ordinary world. Listen long enough for the cuckoo calling from Cuckoo Wood and you'll be rewarded with free entry to cloud-cuckoo-land! That's where the rhyming is: leather with feather. It has to be waited for, and it's the same throughout the rest of the poem. Shall we go a walk, sir? Do you come from Fairyland? I'd LOVE to know the way." I only hope that Enid follows the little man's instructions to the letter. I suspect Enid got things in the wrong order, the twit! At one point in the story (we're back to a consideration of 'The Land of Great Stupids'), an ordinary green chair turns into a flying chair (anticipating The Adventures of the Wishing Chair by some thirteen years). And in the end the boy joins the girl who has been made queen of Great Stupid Land. Why? Because everyone is so stupid compared to her! A nasty day because I didn’t have Hugh. He was with his people at Lockeswood all day. He phoned at 10 pm to say he wouldn’t be down till tomorrow. I worked all day. Enid wrote 'Secrets of the Keepers', a 2700-worder that was to be chapter three of the Zoo Book. Which left the first two and the last two chapters still to be written. Which is slightly odd, to have started from the middle of the book and worked towards each end! Me: Isn't that how books are written in the Land of Great Stupids? Start in the middle, then add a bit towards the beginning, then add a bit towards the end, and so on. Risking getting stuck at any moment. Risking getting into a muddle. Enid: "In the Land of Great Stupids, books are always begun at the beginning and written straight through to the end. But there are a thousand ways to write a book. And I know every last one of them. Or soon will do." Hugh came down at 3.30 & we sat in the garden & the little room till bed. He is staying the night. He was a darling. The work log tells us that Enid wrote her Talk on schedule. What a powerful piece of writing! Enid placing herself in nature and patiently looking at it full in the face. As she did for ‘Hoar-Frost’ in January. As she did for ‘March Winds’. As she did for ‘Blue Magic’ in May. Does the misty gold of summer outshine the amethyst blue of spring? Only the cuckoo can answer that question! But his answer: “Cuck-oo!” is no answer. So on with the game. In 'The Land of Great Stupids', the boy pays for his ticket to travel on a fairy boat with fairy gold. Maybe that piece of writing of a couple of days before had still been on Enid's mind when she set out to write her Talk (or set out on the walk that preceded the Talk). In any case, this piece is a good illustration of what I'd been thinking. Enid looks and looks and looks at the natural world. She understands why the gold colour gets deeper - because the source of the colour that has been diluting it, retreats. She is so in touch with the real world that she gains access to a parallel world of imagination. Nobody gets to see the fairies playing in the field of buttercups who hasn't really seen the field of buttercups first. 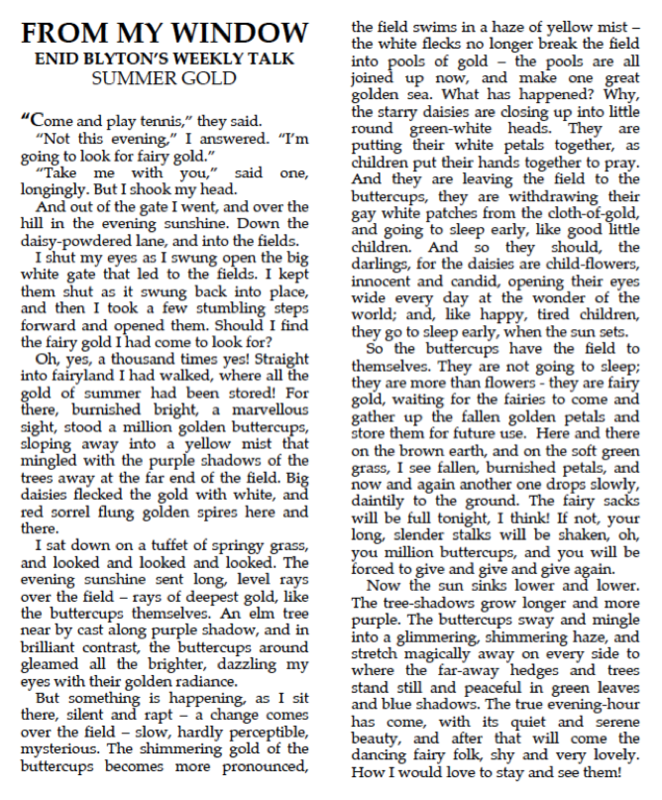 How can you see the fairies if you haven't really seen the fairy gold! To the modern eye, these photos were obviously faked (the girls much later admitted it). The reason that a clever man like Conan Doyle, creator of the Sherlock Holmes and Watson canon, would be taken in by this, was surely linked to the loss of his son in the First World War, and his attempts to communicate with the boy via spiritualism and séances. But I fear I have passed too quickly from the deliciously happy to the dismally sad. I saw Hugh off at the station but I didn’t mind ‘cos he is coming to Oakwood House until we are married, tonight. I worked & read all day & met him at 7. He came round after dinner & we had a lovely time alone in the garden & drawing room. So that's it. Six days after her A Wakeful Night experience, Enid has Hugh where she wants him - living on the same street. Well, no, she wants him in her bed, but that must wait a few weeks more. Enid wrote 'Feeding Time', a chapter for The Zoo Book, which ended up being tagged on to the end of the first chapter, which she wrote on June 19. Worked all day. To Lyver’s with Hugh to dinner & we played Slapdown (?). The log suggests she wrote the poem 'Silver and Gold', which would be the title of the book of poetry that Nelson bring out in 1925, so I guess that Enid was particularly fond of it. Worked all day. Tennis in evening, with Hugh, Mums & Jack. The log tells us she wrote one of her full-page poems about another country, for inclusion in Teachers World extra issue. It's New Zealand and I'm afraid that the last line in the first verse strikes an odd note to a 21st Century sensibility! It can be read here. I would reproduce it on this page, but without a meeting with Phyllis this month, I feel there's not much point in that! Would you wish for mountains towering high, peaked with the glistening snow? Or a graceful line of far-away hills, where a thousand fern-trees grow? Or watch the tide bring the big waves on a hundred different shores? Hang apples enough to feed the folk twice over in London town! Worked all day. Hugh went to Hurlingham to play tennis with Sir F. Newnes & I met him at 9.15 & he came back & sat in garden with me till 11.15. But we quarrelled & it was beastly. I gave Hugh back my ring, but he just put it on again. Enid wrote 'Noah's Ark in London', being the opening chapter to The Zoo Book. Sir Fred Newnes owned George Newnes Ltd, the publisher. Good that Hugh was golfing with the boss? I don't think Hugh would have mentioned Enid to Sir Fred. Well, he might have mentioned The Zoo Book, as something he had commissioned, but not that he was going to marry its author. Later, that was the reason given for so few people being invited to the wedding: Hugh hadn't wanted it to get about that he was commissioning work from someone he was so close to. To lunch with Hugh & sat in his office till 6 & marked illustrations in Fairy Book. To dinner at Lyons & then to Wembley to see the Rodeo. It was GLORIOUS. Went on Racer afterward & it was BEASTLY. Home at 12.30. Enid would write about her Rodeo experience in the next From My Window. Played tennis with Hugh in a.m. & he beat me 6-3 6-2 6-0. We went in for Barnardo Tournament & got top of our set but were beaten in semi-finals. It was great fun. Hugh came home to supper & we sat in garden till 11 & Hugh was a perfect darling. Sat in garden till lunch with Hugh. Afterwards we went to see the new aquarium at zoo & it’s wonderful. Had tea at zoo. Home at 8. Sat in garden till 10.45 & Hugh was a darling lover. It’s been a heavenly day – Hugh’s eyes were as blue as the sky. Again, Enid would write about the aquarium soon enough, but she didn't write anything over the weekend, a weekend spent with her blue-eyed beau. Saw Hugh off at station. Worked all day. Met Hugh at 7. We played tennis till 9.45 & I got beaten. Then we sat out on verandah till 11. I like the way that Talk turns from marveling at the spectacle, to not being able to look, when the injured cowboy makes Enid realize that the spectators’ thrills comes at a human cost. 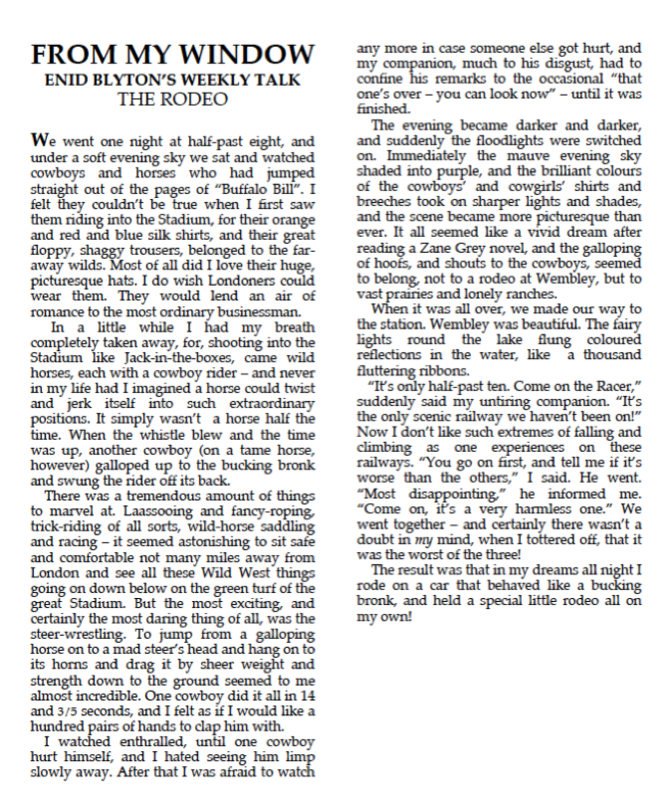 I like too, the idea of the train as a bucking bronk, and that unwittingly Enid became a participant in the dangerous game of staying in the saddle. Lying in her bed at 34 Oakwood Avenue after her Rodeo write-up, Enid manages to stay in control for most of the night, until at dawn her horse gives a particularly outrageous buck and Enid flies out the window and into Cuckoo Wood. 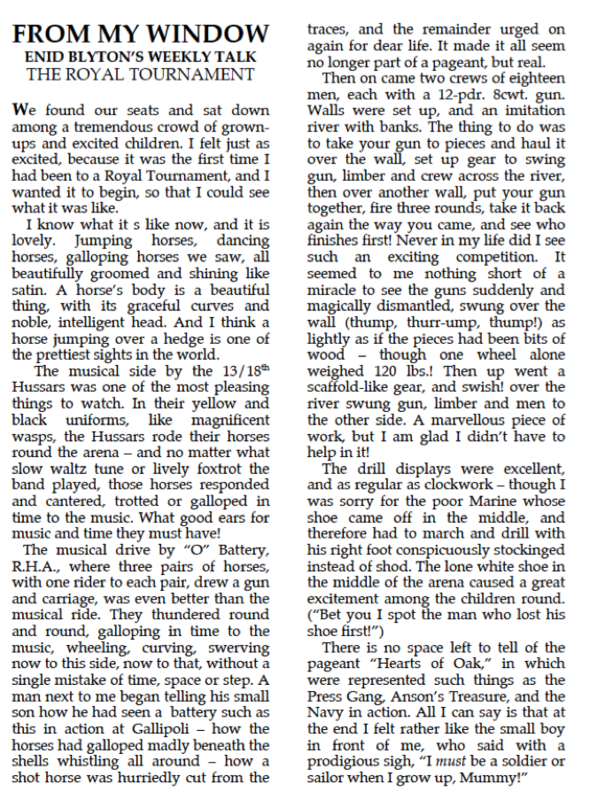 As well as writing about her Friday trip with Hugh, she wrote about her Sunday one as well. Her work log shows she wrote 1000 words about the aquarium for her Zoo Book. Went to station with Hugh. Worked all day. Hugh went to play tennis with Sir F. Newnes again. I met him at 9 & we sat in garden till 11. He was a darling treasure. On Tuesday, Enid carried on writing about 'aquarium creatures', 2200 words for the Zoo Book. The day before's piece, plus this, would comprise the penultimate chapter of that volume. And then what did she write for Teachers World? 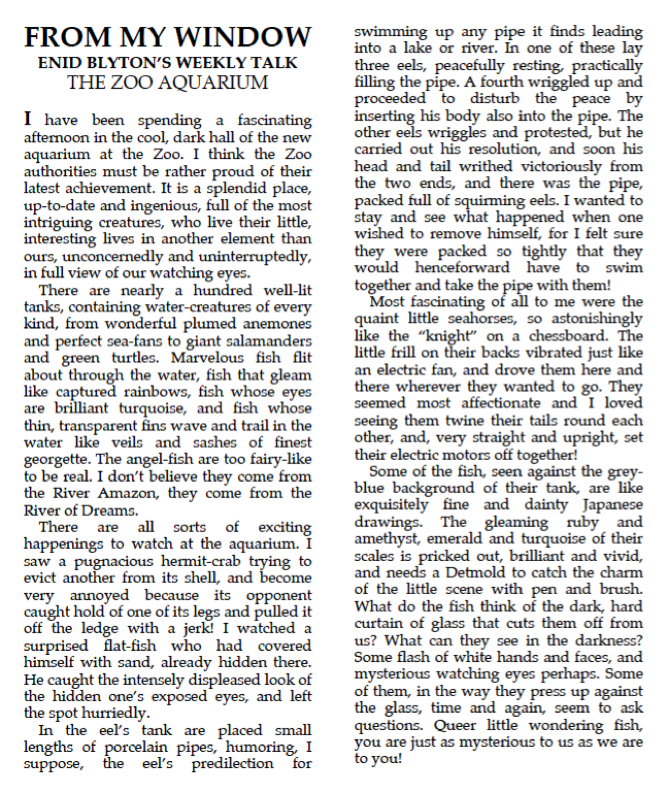 A piece about the aquarium, but with virtually no overlap between what she'd already written for Newnes. Enid Blyton - consummate professional or what? I'm sure she didn't have what she'd written for Newnes in front of her when she wrote her piece for Evans. Any similarity would be due to her excellent memory. Saw Hugh off at station. Wrote poems all day. Met Hugh at 7. We sat in the garden & talked till 11 & he was a darling. She wrote four poems (per work log). The following two ended up in Teachers World, as did 'Sunlight and Shadow'. Wrote letters till lunch. Hugh phoned at 3.30 & asked me to go up to Lyver’s [?]. I met him at 6 & we went to see a flat but didn’t like it. Then to Lyver’s – Mr & Mrs Pollock were there & they were darlings to me & I loved them. I think they will love me too. They are perfect dears, just like my darling Hugh in their ways. We saw them off at Fenchurch St. & then came home ourselves. I’m so glad I’ve seen them. So that's the in-laws met and no doubt charmed. Messed about all day, doing washing etc. I felt tired. Met Hugh at 7 & after dinner he came across & we had the evening on the verandah. No writing done, according to the work log. The others went to Felpham by car. Hugh went to Margate with Newnes. I met him at 5.20 & we went & had tea at a hotel & then dinner at Victoria & then to the Tivoli to see the Rodeo & “Women Who Give” at the pictures. Home at 12.30. Felpham is by Bognor Regis on the south coast, West Sussex. Three hours from Margate which is at the tip of Kent. I think Enid means she stayed in Beckenham until Hugh returned from his day out with the boss. Had all my meals at Oakwood! In garden all a.m. & slept all afternoon together! Hugh snored & waked me up. On verandah all evening with Hugh & then indoors. Hugh was a darling all day. Enid means she had all her meals at Hugh's place, Oakwood House.They spent the day together, hence no writing. To breakfast with Hugh & then down to station. Met him at 7, after having worked all day. Lunch at Heathfield. Hugh & I sat on verandah all evening. Enid finished the month by writing a chapter for The Zoo Book, called 'Zoos of other Lands'. However, the chapter didn't make it into the published book. But let's end the month on a positive note. As there hadn't been a meeting between them in June, let's end the month with an Enid Blyton/Phyllis Chase meeting. Of minds. Enid: "I can't wait for July." Phil: "I thought you were getting married in August." Enid: "Yes, but July is next."